Introducing the coach of the month. 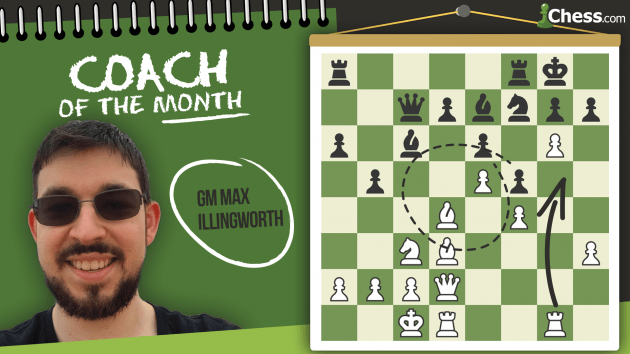 We are thrilled to introduce a new series at Chess.com: coach of the month! Each month, we will be highlighting a coach at Chess.com/coaches and sharing an interview with that coach discussing his or her philosophy of chess, philosophy of coaching and more. We hope this will be an instructive series and may help some out there to find the perfect coach for them. Our first coach is GM Max Illingworth (@Illingworth) of Australia. Max will be familiar to Chess.com regulars from his popular blog, where he often provides excellent training positions and very personal thoughts about the game and chess improvement. Max is the 2018-19 Australian champion and played for the Australia Kangaroos in the PRO Chess League. He also has a premium video series on Chess.com focused on helping you improve your game. Max recently announced his retirement from competitive chess to focus on teaching and other aspects of the game that he immensely enjoys. At what age were you introduced to chess, and who introduced you? I learned chess at six and a half years of age, from my mother. What is your first vivid memory from chess? My first vivid memory from chess comes from my family's Europe trip when I was six years old. While I was in Salzburg, Austria, I saw two old men playing on a giant chess set outdoors. I was immediately transfixed and very keen to learn the rules of this new game, "chess." Which coaches were helpful to you in your chess career, and what was the most useful knowledge they imparted to you? All of my coaches helped me at some stage to become a stronger player. Those that had the greatest influence on me were surely IM John-Paul Wallace, FM Brett Tindall and GM Ian Rogers (all of whom remain good friends to this day). I should also credit IM Laszlo Hazai, who I worked with just before attaining my first two GM norms, and GM Surya Ganguly, who also helped me immensely just before I achieved my final GM norm. Chess is mainly a skill-based rather than a knowledge-based game, so I would consider the most useful knowledge my coaches imparted to be in the way they approached games and chess training. They all emphasized the importance of regular practice and consistent study for achieving optimal results. I also value my coaches for being a strong male figure in my life as I was growing up, and they've had a substantial influence on the way I coach and write about chess now. Which game do you consider your masterpiece? A few years ago, my answer to the same question was that it was my 2014 Olympiad game against GM Liviu-Dieter Nisipeanu, but my best game is hopefully yet to come! However, this is still the game most consider the best in my career. How would you describe your approach to chess coaching? On the most basic level, my role as a coach is to help others as much as possible to become stronger chess players and achieve their chess goals. I do this by first actively listening to my students and discussing their games, so I understand their thought process and recognize the main challenges they're facing in improving. From there, I give my students practical thinking techniques, practice in applying them, and then direct their chess training with concrete recommendations, so that they can apply these techniques automatically and effectively in their games. I've also found that one of the greatest benefits of coaching is that it provides a great feedback loop for students. They can immediately compare your thought process with best play, or at least how a stronger player approaches the same challenge, and learn something new while seeing how to improve specific skills. Also, students can ask questions and get clear direction in areas that might otherwise be unclear to them, or where they might draw the wrong conclusions on their own. In short, I focus on understanding the students' chess challenges, and giving them the solutions they need. What do you consider your responsibility as a coach and which responsibilities fall on your student? Chess players are generally quite astute and understand that coaching on its own won't make you a champion—you are the one taking your chess journey, playing your moves on the board, and putting the work in outside of lessons. Essentially, the student is responsible for their own results. That being said, the coach has the responsibility of helping their students as much as they can in the time they work together. The coach should also take the time to answer the student's questions, actively involve the student in the lesson (no uni lectures! ), identify the student's main challenges in getting better, and offer a possible solution. In my case, I go several steps further, and consider it my full purpose and responsibility to learn as much as I can about chess improvement and coaching, including from several related fields outside of chess. My life purpose now is to help as many players as possible improve their chess skill as much as possible, and therefore I give every single lesson everything I have and fully apply myself in the lesson. I also extend this to my frequent discussions about chess improvement and coaching with players of all levels. Outside of the actual lessons, I prepare lesson files (averaging around 64 games per lesson), give all my students a chess training plan (which I am currently evolving into the first full chess curriculum from beginner to grandmaster), answer student questions outside of lessons, and send group emails to all my students with general chess training and life advice. In 5-10 years' time, I think students will also expect chess coaches to help them solve certain life/mindset challenges that are negatively impacting the student's chess results, and indeed, this is one of the main areas I work on in my daily research on improvement. What is a piece of advice that you give your students that you think more chess players could benefit from? Last year, GM Jacob Aagaard told me (in a group coaching session) that the main weakness chess players have is that they don't look for alternatives enough. I have found this to generally be the result of making assumptions—so my concrete advice is to be aware of our assumptions and challenge them with questions. If you start saying 'I have to play this/they have to play that')—Do I/they 'have to' play this move? Are there any alternatives? When your opponent makes a threat—Is my opponent's threat real? Can I play my idea anyway, or make a stronger threat in reply? This move creates a weakness—Is it really a weakness? Can it be exploited? Do I gain a useful advantage in return? I would also recommend that you make sure you learn something from every game you play. Don't just run your game through the engine—figure out what moves you needed to see, or what you needed to appreciate in the position, to play the best move. What is your favorite teaching game that users might not have seen? I cover different chess material with each of my students as much as possible, although there are some examples that inevitably come up several times for their instructional value. Honestly, I don't really subscribe to the concept of having favorite things, but I will share with you my detailed analysis of Paravyan-Golubov from my private training files, because I think it's an almost perfect example of how to calculate accurately—both in looking for candidate moves in a tactical position, and going beyond our initial assumptions about a position or move. What is the puzzle you give students that tells you the most about how they think? 1) What tactic can White play after 8...dxe4 9.Nxe4 Nxe4 10.Bxe4 e5? 2) What should White's plan be after 8...dxe4 9.Nxe4 Nxe4 10.Bxe4 Nf6 11.Bc2 h6? 3) How should White handle the central tension after 8...dxe4 9.Nxe4 Nxe4 10.Bxe4 h6 11.Bc2 e5? 4) How should White handle the central tension after 8...dxe4 9.Nxe4 Nxe4 10.Bxe4 c5? 5) How should White handle the central tension after 8...dxc4 9.Bxc4 e5? 6) Where should White's bishop retreat after 8...dxc4 9.Bxc4 b5? In my view, players of all levels could evolve their approach to chess through deeply exploring the answers to these questions. This example also shows very well the "Australian" philosophy to chess coaching—that every position contains some sort of lesson. Do you prefer to teach online or offline? What do you think is different about teaching online? I love coaching in any form if the student is ready to learn, but to be honest, I have found online coaching to be more effective for teaching, because you can move the pieces more quickly on the screen and keep a record of everything discussed in the lesson, including thorough typed notes. This is very important, because in conversation, we will tend to understand a slightly different meaning to what the speaker intended (look up "the telephone game" as an example), and through notes written during the lesson, the student can revise the lesson at any time and understand exactly what the coach means, without any confusion. For local students, I like to have our first lesson in person, because it establishes a strong initial personal connection between me and my student. However, most of my current friends (including students) are people I've never met in person (thanks to Facebook). At least in my case, I've found that you can have great relationships and connection with people without ever meeting them in person. One thing I have observed is that a lot of parents (at least in Australia) believe that face-to-face coaching is better for their kids than internet coaching. That might be true for beginners (who can't express their moves in chess notation), but I have successfully coached many seven-year old students over the internet. The key ingredient for success here is that one of the parents supervises the child during the lesson, to ensure they don't lose focus. What do you consider the most valuable training tool that the internet provides? I think the main opportunities that the internet has offered aspiring chess players is the opportunity to practice against other players around their level at any time, and to work with chess trainers from anywhere in the world. In the past one had to live in a "chess country" to become a very strong player, but now, when you look at the FIDE rating list of top players, you see just how multicultural and diverse elite chess has become. Which under-appreciated chess book should every chess player read? I will go with How to Choose a Chess Move by Andrew Soltis, as learning and trying the calculation techniques in this book saw me quickly jump from 1800 to 2100. I am currently developing and evolving Soltis' ideas in my own training material, with the aim of providing a simple but effective system of calculation for amateur players.